As a Driver’s License Restoration Attorney, I get questions about every part of the License Appeal process. In this blog, I have tried to answer as many of those as possible, and anyone interested in learning about this Process should read through the whole Driver’s License Restoration category. Since a good part of my Practice involves handling License Appeals for people who have moved out of State, I’ve run across pretty much every situation imaginable as it relates to having a Michigan License that has been Revoked for 2 or more DUI’s. One such circumstance has come up several times recently. This article will focus on those situations where a person whose Driver’s License has been Revoked in Michigan has been able to obtain a License in another State, only to find that they cannot renew it and must clear up the Michigan Revocation before they can be re-licensed elsewhere. As a general rule, once a person’s License has been Revoked in Michigan, they will be unable to secure a License in any other State. This is because the National Driving Register ( NOT the “National Driving Registry,” which is a for-profit site trying to cash in on the similarity of the names), maintained by the National Highway Traffic Safety administration, keeps a record of all state actions against a person’s License. Thus, when a person goes into a Department of Motor Vehicles in a state other than Michigan (where we call such a bureau the “Secretary of State”), a check is run both through that state’s records, and the NDR. Once a person comes back as Revoked in Michigan, the state in which the Person is trying to get a License will inform them that they are ineligible for a License until they clear up the Michigan Revocation. This wasn’t always the case. In fact, although I have no specific data regarding when any particular state started using the NDR, what’s clear is that any number of years ago, some states clearly did not. I have 2 License Appeal cases right now, one for a person who was able to get a License in Florida, and another in Oregon, some years ago. In each case, they were told that they would be unable to renew those Licenses until the Revocations from Michigan are cleared. Obviously, since the time each of those Clients first obtained their out-of-state License, both Florida and Oregon began checking the National Driving Register. To the best of my knowledge, every state in the Country now runs a check of the NDR before issuing a License. Of course, I know that anyone contacting me about a Michigan Clearance has already been denied in another State. To clear the way for being Licensed in another state, a person must obtain a “Clearance” of their Michigan Driver’s License. In other words, a person who has moved out of state is not eligible to have a Michigan Driver’s License “Restored,” unless they’re moving back to Michigan. This means that they’re asking the Secretary of State’s Driver Assessment and Appeal Division (DAAD), which handles License Appeals, to give them the green light to obtain whatever kind of License they can obtain in another State. In other words, the DAAD is being asked to completely “clear” them. This raises a very important issue. If the person was still a resident of Michigan, and was applying for Restoration of a Michigan Driver’s License, they’d only be considered for a Restricted License, meaning that in addition to limitation on the purposes and/or times within which they could drive, they’d also be required to have an ignition interlock installed on their car for at least 1 year. A Clearance, on the other hand, almost amounts to a “full license.” The DAAD will have no ability to monitor a person for a year and see how well they handle being re-licensed, and no ability to require the ignition interlock on any vehicle the person may drive. In a very real way, winning a Clearance takes a bit more than winning a Restricted License. The Legal Standard governing Appeals for Clearances and License Restorations is the same, and is set forth in Rule 13. That said, one simply cannot escape the fact that the relief available for a Michigan resident involves a rather high degree of supervision and oversight, whereas the only kind of relief available to an out-of-state resident is entirely unsupervised. A common misconception is that the DAAD will go easier on an out-of-state Resident because they’re essentially “someone else’s problem.” That’s simply not the case. In fact, as noted above, the reality is that it is quite the opposite. Ask any veteran License Restoration Lawyer and you’ll find that obtaining a Clearance is a tougher job than winning a Restricted License. Nor is the State persuaded by the fact that the person Appealing has obtained a License in another state. In fact, that has absolutely zero evidentiary value. Instead, the DAAD, as always, focuses its inquiry on, amongst the other legal issues outlined in Rule 13, whether the person is a demonstrably safe bet to never drink alcohol again. All of the interim driving in the world, however legal it may have been, does not begin to answer that question. 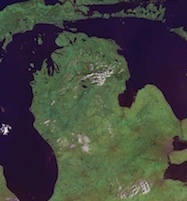 The end result in any such out-of-state Deriver’s License odyssey, however, is that a Michigan Revocation does and will show up on the National Driving Register, and a person either seeking to obtain a new License, or renew one in another state, will have to obtain a Clearance of their Michigan Driving Record.